From Mianyang to Macau, now you can join the conversation with Instant Immersion Mandarin Chinese Audio Deluxe, the dynamic language learning system comprising 8 compact discs of recorded audio instruction. 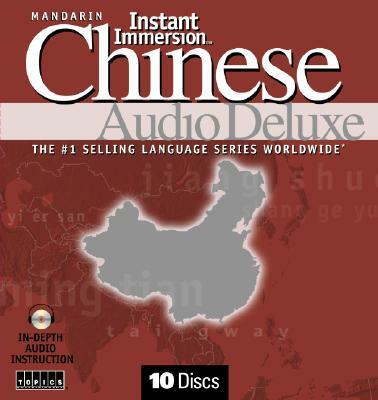 Also included, the complete, printable transcript of your audio lessons on CD-ROM, which allows you to follow along and Talk Now Mandarin on CD-ROM, offering comprehensive fundamental vocabulary and accurate pronunciation in a fun, user-friendly format. Description: 10 disk set with 8 audio CD's and 2 CD-ROM with a complete printable transcript of the audio lessons. All the disks look good and are guaranteed to function as produced. Comes with hard plastic case with disk covers.